But even though we are self-confessed, fresh-off-the-boat from-away inn owners (most recently from NJ, but before that, Nebraska, Nevada, California, Germany), we have been made to feel very welcome in Camden. It’s a great community. And these days, being from away doesn’t seem to carry the stigma it used to, probably because of the large influx, over the past 20-30 years, of non-natives who have fallen in love with Maine and moved here to live their dream life of small farming, or artisanal cheese-making…or inn-keeping. Our contractor, Craig, says he heard that the from-away people now outnumber the natives by 2:1! But there are moments when we do feel our from-away-ness. We call them Driveway/Parking Lot Moments. We’re stealing this term from NPR. In NPR’s Driveway Moments, you are so riveted to a story that when you arrive home, you sit idling in your driveway rather than miss the end. Here at Towne Motel, we have two versions of Driveway Moments. In the first, we are helping guests with their luggage or waving goodbye. But it’s the second version that we’ve been experiencing more often lately, as the weather has gotten colder. In Driveway Moment #2/Winter, we stand in the chilly parking lot with our plumber Casey, or our snow plough guy Bob, or another hardy (usually male) Mainer, and get into long-ish conversations about “systems” and “cascade effects,”…or where the giant piles of snow will go. The guy in question is wearing a flannel shirt, we are wearing down jackets, and we are shivering. 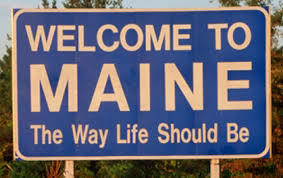 This is where the native Maine guy begins to have some fun with the from-away girls. A sadistic gleam comes into his eye, and he asks (barely suppressing a grin), “Ever been here in the winter?” He’s pretty sure of the answer. We’ve been trying to establish some cred by noting we used to live in Nebraska…this gets an eyebrow-raise of respect, but our guys are still having fun piling on the horror stories. We’d like to note (as I told Casey) that on Monday, NJ got eleven inches of snow, and here in Camden we got like….two. But time will tell…stay tuned for more winter adventures from Towne Motel! This entry was posted on Thursday, December 12th, 2013 at 11:14 pm and is filed under From-Away in Maine. You can follow any responses to this entry through the RSS 2.0 feed. Both comments and pings are currently closed.